In many laboratories, bench space is at a premium. 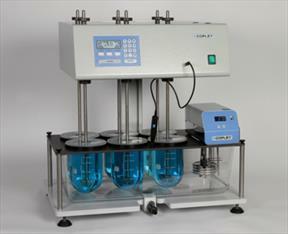 The Tablet Dissolution Tester DIS 6000 has been designed as a direct response to this problem. With a footprint of just 650 x 450 x 640 mm (WxDxH), the DIS 6000 is one of the most compact dissolution testers available on the market today. The unit has six stirred test vessels arranged in two rows of three. A common complaint from customers is that their existing dissolution tester is overly complex with unnecessary software functionality for day-to-day use. For this reason, considerable attention was given in the design to ensuring that the number of actions necessary to perform a test was kept to a minimum. Once the test sequence has been initiated, all that is necessary to start the test is to input the nominal rpm and temperature required, together with the duration of the test and the report interval (the time interval during the test at which the actual rpm and temperature is logged and subsequently reported), introduce the samples and press START. For comprehensive product details, specifications and part numbers, please request a copy of our brochure “Quality Solutions for the Testing of Pharmaceuticals”.